from 15 pcs. 1.79 CHF ea. from 40 pcs. 1.64 CHF ea. from 80 pcs. 1.54 CHF ea. These decorative and handy office magnets are not just suitable for magnetic glass boards. 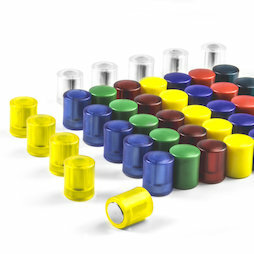 These power magnets also work well on whiteboards, magnetic boards or walls that are painted with magnetic paint. Thanks to the integrated neodymium magnet, these easy to grasp cylinder magnets can hold up to 8 A4 sheets, even on smooth surfaces. Which of the nine colours is your favourite? 5 pcs. 1.20 CHF ea. Many owners of decorative magnetic glass boards> have realized that common magnets don't adhere well to them, which leads to disappointment. You may have better luck with strong disc or cube magnets, but there are often issues with handling them - they strongly adhere to each other, which makes it hard to separate them. These power magnets solve this problem because they are strong and thanks to their plastic coating easy to grasp and separate.